A mouse's squeak is a primary form of communication, just like barking is for dogs or meowing is for cats. Why a mouse squeaks depends on the circumstances. The squeaking might mean he's in trouble, or he's quite content. As you become more familiar with your pet, you'll learn to recognize the difference between normal squeaking and a noise indicating trouble. Pet mice aren't usually territorial in the manner of some other small pets, such as hamsters. If you're keeping multiple mice together, females generally get along very well. 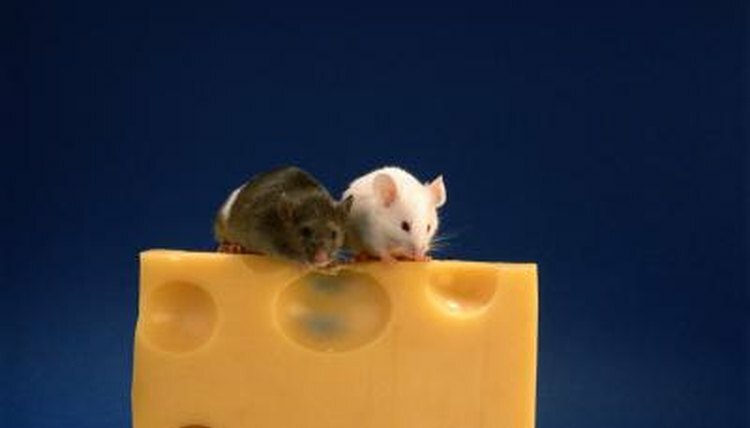 Male mice might or might not be compatible, so they could require separation. A lot of squeaking coming from the mice cage might indicate fighting. If it's more than just a spat, you'll have to house your pets by themselves in their own cages. Sometimes, putting your mice in a considerably larger cage can stop the fighting. When introducing new mice to each other, do so on neutral territory. A new, clean cage works best. It can take a few days for the mice to accept each other. You're likely to hear a lot of squeaking during the introductory period, but that's normal behavior. There's also likely to be a lot of chasing, according to the Rat and Mouse Club of America website. As long as they don't draw blood, the mice should be fine with each other within three days. If blood is drawn, separate them. You might also hear some squeaking after you've cleaned the cage, since that's when mice re-establish their territories. Keep an eye on your mice when you put them back in the cage after cleaning. You'll need to handle your mice regularly to hand-tame them. Pick your mouse up gently by his tail root -- not the tip of the tail. Then, transfer him to your hand. If he's uneasy, you might have to keep holding his tail root so he doesn't jump out of your hand. If you handle him correctly, he won't squeak. If he does start squeaking a lot, you are hurting him. Mice are nocturnal, so you're likely to hear a lot of squeaking at night. Provide your mice with tunnels -- old paper towel rolls fill the bill -- along with an exercise wheel. You can purchase mouse "ladders" and other climbing equipment at the pet store. Expect them to squeak while playing. They're having fun. If you hear excessive noise, check on your pets. It's possible a mouse got caught under something in the cage or there's some other issue.